Rules: The target in the Chess play is to obtain a checkmate – trapping your opponent´s king. The term checkmate is an alteration of the Persian phrase “Shah Mat”, meaning literally, “the King is ambushed”. White always start first to move and players take turns alternately moving one piece at a time. Movement is mandatory. 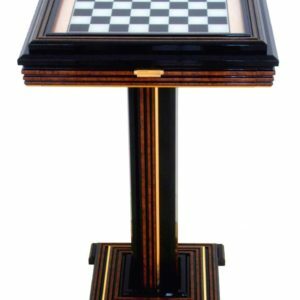 If a player can not move any chessmen, he is not in check but has no legal moves, this situation is called “Stalemate” and it ends the game in a draw. Each type of piece has its own specific movement. 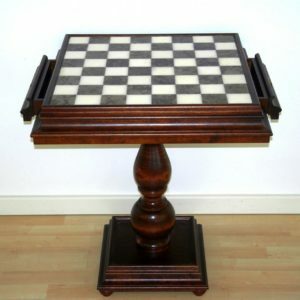 A piece may be moved to another position or may capture an opponent´s piece, replacing on its square. A piece may not move over or through any of the other pieces except the Kinght. When a king is threatened with capture (but can protect himself or escape), it´s called “Check” and you usually declare it to the opponent. If a king is in check, then the player must make a move that eliminates the threat of capture and cannot leave the king in check. Checkmate happens when a king is placed in “check” and there is no legal move available to escape. “Checkmate” ends the game and the side whose king was checkmated looses. 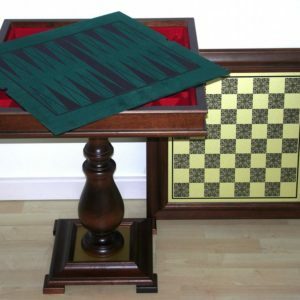 The chessboard is made up of eight rows and eight columns for a total of 64 squares of alternating colors. Each square in chessboard is identified with a unique pair of a letter and a number. The vertical files are labeled A through H, from White´s left (i.e. the queenside) to White´s right. Same way horizontal ranks are numbered from 1 to 8, starting from the one nearest White´s side of the board. Each square of the board, then, is identified by its file letter and number. In the initial setup, the light queen is positioned on a light square and the dark queen is situated on a dark square. The diagram below shows how the pieces should be initially situated. Pawns can move forward one square, if that square is unoccupied. If it has not yet moved, the pawn has the option of moving two squares forward provided both squares in front of the pawn are unoccupied. A pawn never move backward. NB: Pawns are the only pieces that capture differently from how they move. They can capture an enemy piece on either of the two spaces adjacent to the space in front of them (i.e., the two squares diagonally in front of them) but cannot move to these spaces if they are vacant. The pawn is also involved in the two special moves en passant and promotion. En Passant may only occur when a pawn is moved two squares on its initial movement. When this happens, the opposing player has the option to take the moved pawn “en passant” as if it had only moved one square. This option, though, only stays open for one move. The En Passant move was developed after pawns were allowed to move more than one square on their initial move. The idea behind this rule was to retain restrictions imposed by slow movement, while at the same time speeding up the game. 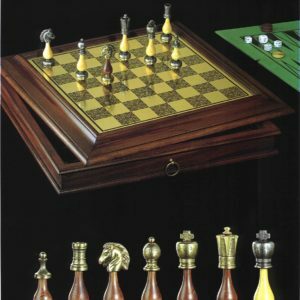 If a pawn reaches the opponent´s edge of the table, it will be promoted – the pawn may be converted to a queen, rook, bishop or knight, as the player desires. The choice is not limited to previously captured pieces. Thus its´ theoretically possible having up to nine queens or up to ten rooks, bishops, or knights if all pawns are promoted.